It is my pleasure to report that another milestone has been reached, version 1.1 finished its beta stage and was released as stable. Grab it at the Download page. Check out the refreshed Features page with new screenshots, and Changelog page with more changes listed. Reporting this after a few days from the release, as one should, not. The UI navigation was slightly changed, now pages are grouped on the left navigation, making it a bit more clear which action does the page belong to. 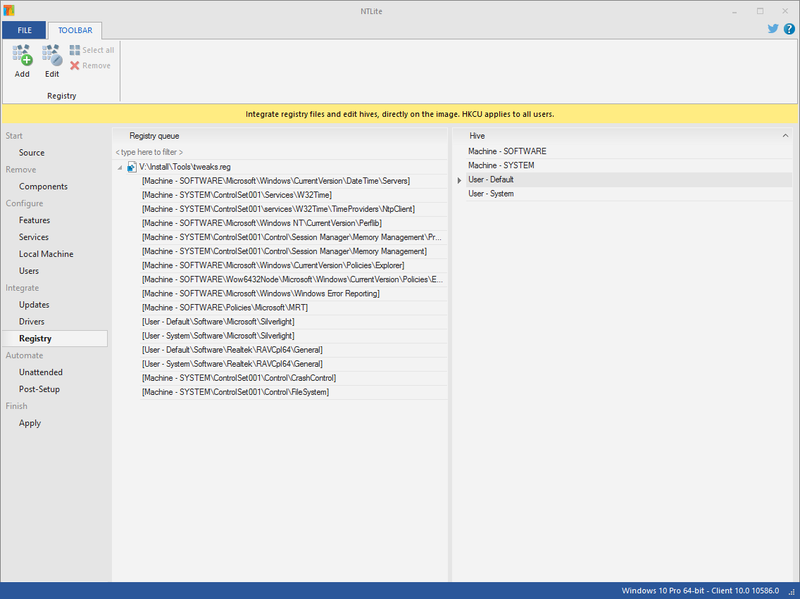 Registry integration page, applying REG files directly into the image hives. 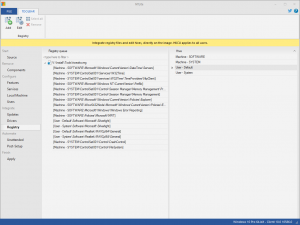 There is also an easy way to directly edit registry hives manually, if one wishes to. 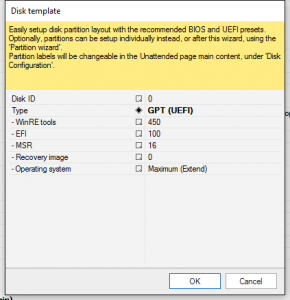 Disk Template partitioning wizard. Makes it a breeze to setup Unattended auto-partitioning. There is also the previous Individual partition for further customization. Long path support, bypassing Windows limitation of 260 characters in a file path. Lately this became an issue with Metro apps having Program Files as the root, then together with mount folder it passed the 260 mark. Bunch of new components, plus fonts are now individually removable. Now onto v1.2, already tons to do, will prioritize to your feedback over the years. Thank you for the support, it makes it a joy to evolve this lil’ helper.